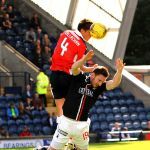 Raith Rovers succumbed to their first league defeat since March, after a toothless 2-0 defeat to Peter Houston’s Falkirk side. Manager, Gary Locke was forced into two changes from the side which went down to Forfar Athletic in last week’s Irn Bru Cup tie, with Jean-Yves M’Voto and Mark Stewart both out missing through injury. However, Jordan Thompson returned to the team after his international duty with the Northern Ireland under-21 side, starting in the middle of the park alongside Ross Callachan, while Jason Thomson returned to his familiar right-back berth. 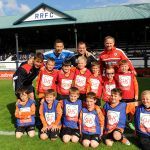 With Rovers not having their troubles to seek in terms of injuries, with Gary Locke again unable to list a full complement of substitutes, there were fears in the game’s opening seconds, when Callachan went down after a tangle of legs, but after some lengthy treatment, the midfielder was back up and running. Injury worry aside, Rovers began the match in an upbeat fashion, with Bobby Barr featuring prominently, while the midfield were popping the ball around reasonably well. A free-kick from Lewis Vaughan from the left-hand side was only half-cleared, but from 25-yards out, Kevin McHattie could only clatter his effort skyward. While chances were proving scarce in open play, Rovers passed over a gilt-edged chance on the twenty minute mark from a free-kick. Lewis Vaughan’s set-piece from the left found Davidson in clear space at the back-post, but with approximately 50% of the unguarded net to aim at, he somehow managed to send his header into the seats of the away end, as the home support in the opposite stand, stood up to acclaim a goal which failed to materialise. The fear at that stage was that Rovers may regret failing to grasp such a chance, but the home team continued to push on, with more good work by Barr down the left, eventually ending with Callachan being teed up, but his shot was easily held by Rogers. Rovers had failed to make the most of their chance when it fell their way, but the same wasn’t the case for Falkirk, who took the lead in the 30th minute, with their first decent opportunity. Mark Kerr, a player who has so often been a thorn in Raith’s flesh, picked out John Baird who was in yards of space on the edge of the area, and although the former-Raith forward’s pivot and finish past Connor Brennan were both excellent, both Rovers central-defenders would have been disappointed with how much room the striker was presented with. 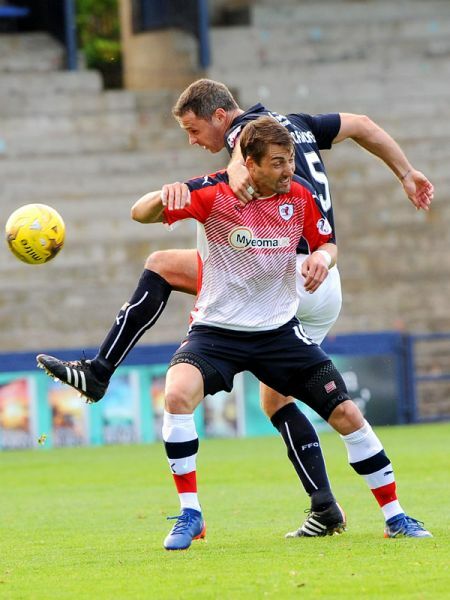 Going a goal down failed to liven the home players from their slumber, with another wayward free-kick from Vaughan, the only half-chance that came their way, as the Falkirk defence effectively kept the strike-force at arms-length. 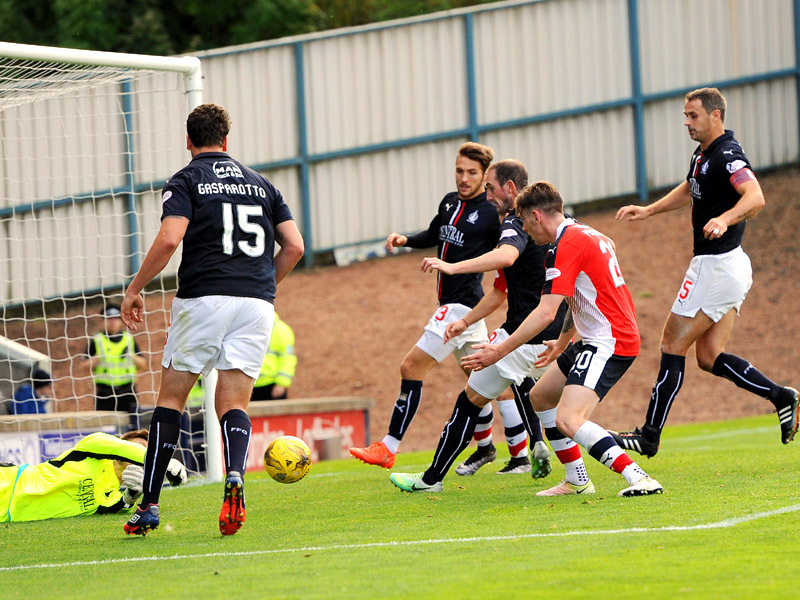 Rovers were immediately on the front-foot in the second-period, with there best outlet, Barr galloping down the left, and while his cross into the area found McManus with his back to goal, he found himself surrounded by a posse of Falkirk players, and his shot was inevitably crowded out. Kevin McHattie then tried his luck from distance, but his shot whizzed past both Rogers left-hand post, and Vaughan, who was unable to stick out a foot to prod it home. 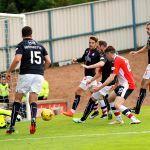 The second-half was following the same pattern as the first, albeit Raith were arguably finding it even tougher to fashion any chances. Neither of the full-backs were getting much joy down the wings, while the midfield, Barr apart, were failing to provide any kind of supply to the front-two. In an attempt to change that, Locke made his first change with 30 minutes remaining, with Scott Roberts coming on for Thompson and going out wide, with Ross Matthews moving into the central position. 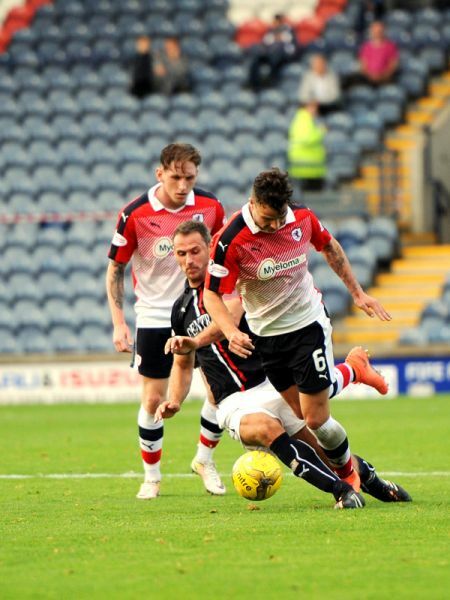 Falkirk were enjoying more possession than they’d had in the first 45, but like Raith, they appeared to have little clue in what to do with it, in a match which was predominantly bogged down in the central third. With 25 minutes left, Barr picked up the ball in his own half, and with little other options available to him, he decided to just run-and run, eventually making his way to the bye-line and picking out McManus. However, despite fasihioning a sliver of space for himself, he squared it across goal to no-one in particular, and the chance was gone. 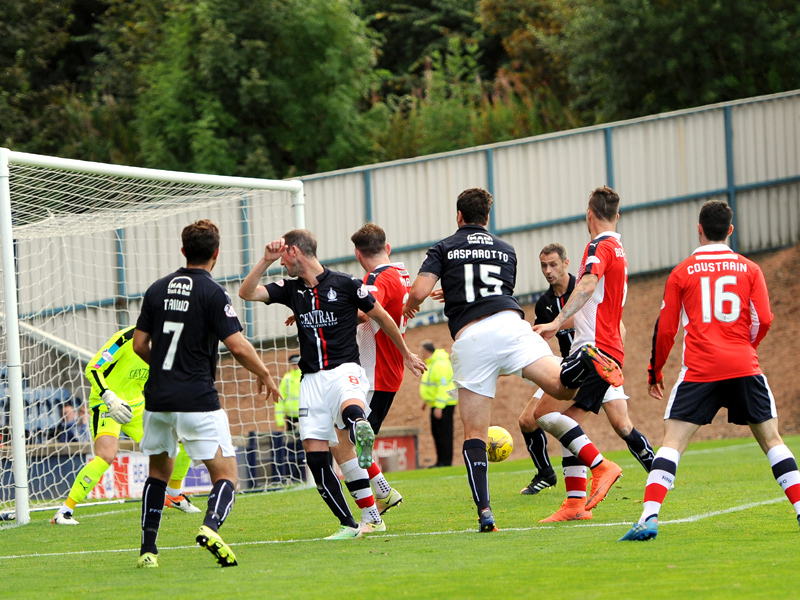 Five minutes later, Raith made their second change, with Rudi Skacel replacing Vaughan, but within minutes, Falkirk had doubled their lead. John Rankin was allowed to roam forward from midfield, but despite his cutback looking fairly innocuous, Brennan was unable to deal with it effectively, allowing Tom Taiwo to calmly finish from inside the area. 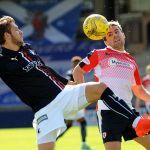 The goal ended any hopes Raith harboured of getting anything from the game, with a late penalty shout their only notable contribution as the game petered out. Rovers will be hoping to get back to winning ways next Saturday, when they head to Dumfries to take on unbeaten Queen of the South. Lovely sunny day for the biggest game in Scotland! A half of two halves. Raith dominated an entertaining game for 20/25 minutes, then Falkirk got to grips with us and were the better team in a towsy battle. McHattie unleashes one of his trademark rockets. Low and hard, but unfortunately wide. Davidson volleys into row Z. Literally. Davidson flattened in the box by Gasparotto. Nothing given, and Davidson's booked for protesting. 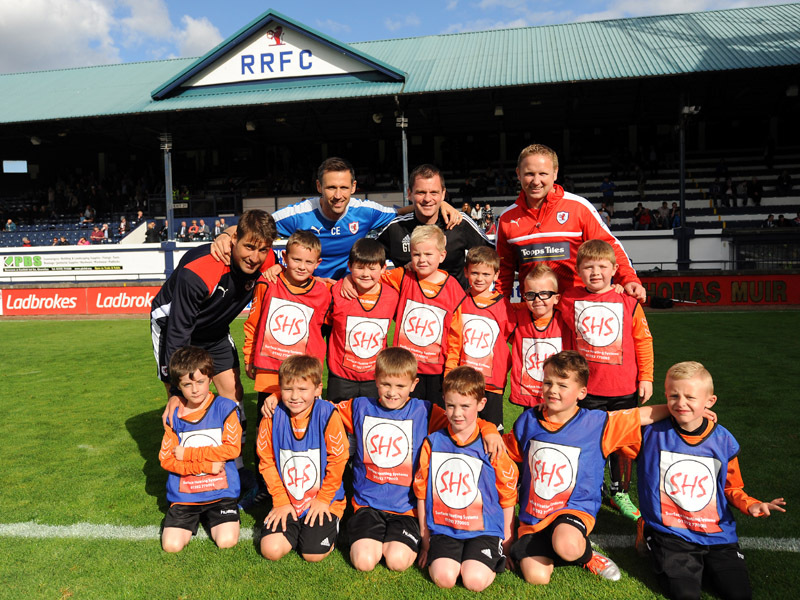 Rovers well beaten after dominating the opening period. Lots of effort but no cutting edge. 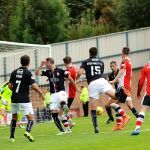 Peter Houston’s Falkirk side are the visitors to Stark’s Park this Saturday, and they’ll be looking to extend their winning run to three matches, after recent victories against Dumbarton and Elgin City. Those results came on the back of three league matches without a win for the Bairns, who’d taken just one point from their opening three fixtures against Hibernian, Queen of the South and Morton. However, the 1-0 win over Dumbarton lifted last season’s Championship runners-up up to sixth in the table, just a point outside the play-off spots. The departures of key-players, Will Vaulks and Blair Alston in the summer, left Peter Houston with the vexing problem of how to replace them, although a number of new faces have arrived since the clubs last met. Defender, Luca Gasparotto has signed after leaving Rangers, and he could be joined in the back-four by Lewis Kidd, who was acquired after leaving Queen of the South. Familiar face, James Craigen swapped Stark’s Park for the Falkirk Stadium, while John Rankin also joined after departing Tannadice. 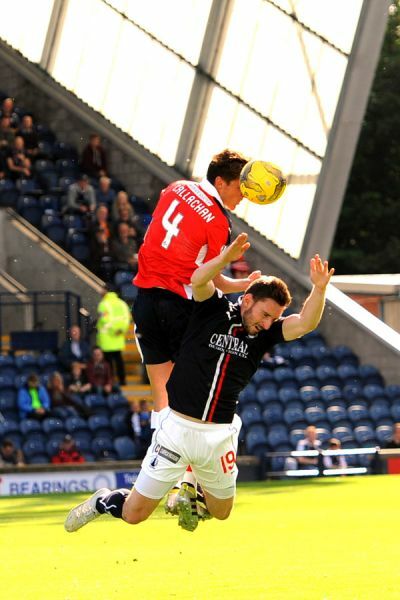 The last time Raith took three points from a home fixture against Falkirk was back in November 2012, when Grant Anderson scored a late winner, after David Smith had cancelled out an opener from Falkirk’s Luke Leahy. 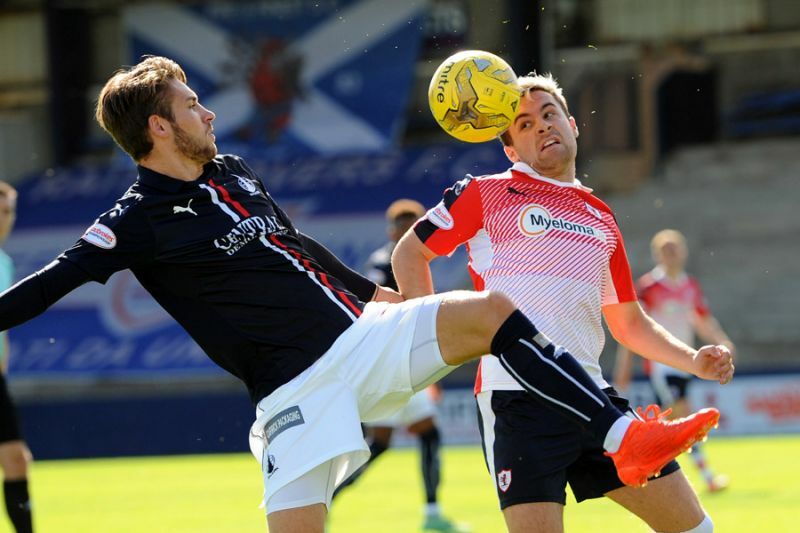 Unsurprisingly then, Raith Rovers have a poor recent head-to-head record against Falkirk, with just one win and four draws from their last ten meetings. In response to a recent event at Stark’s Park, please see Ground Rules and Regulations number 27.